This page compares NFC tag vs NFC reader and mentions functional difference between NFC tag and NFC reader. It mentions difference between different NFC tag types 1 to 5. NFC network consists of two devices viz. initiator and target. There are two basic modes of operation in NFC network known as active and passive. In NFC active mode, both initiator and target devices will have their own power supply or battery for operation. In NFC passive mode, one of the NFC device will have power of its own while other device is full passive and derive its power from active powered device. Both NFC tag and NFC reader communicates using 13.56MHz frequency for operation. They use ASK modulation for modulating the data to be transmitted before being translated on RF carrier of 13.56MHz. The NFC devices utilize concept of electromagnetic induction between loop antennas for connecting. Figure-1 depicts internal block diagram of NFC tag device. 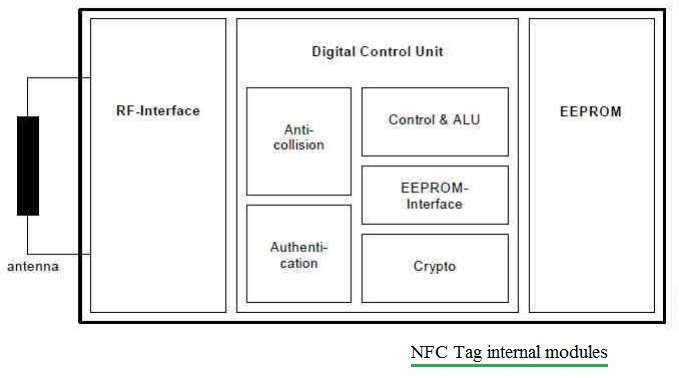 NFC tag usually consists of EEPROM, processor or microcontroller unit, anti-collision algorithm, authentication and cryptographic mechanism, RF interface circuit, RF antenna operating at 13.56MHz etc. • NFC Tag can be either active or passive device. • Data access mode read/write or read only. Refer difference between NFC tag types➤. Usually NFC tags are available which transfer data at the rate from 106 kbps to 424 kbps. 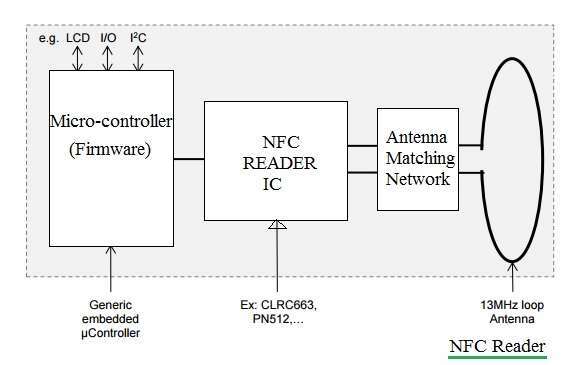 Figure-2 depicts internal block diagram of NFC reader device. NFC reader usually consists of microcontroller unit such as LPC series, NFC reader IC, antenna matching circuit, 13.56MHz loop antenna etc. Popular reader ICs used in NFC reader are CLRC663, PN512, SLRC610, PR601, MFRC522, PN7120 etc. developed by NXP semiconductor. • NFC reader is always an active device. • Host interface e.g. SPI, I2C, RS232, UART etc. are available. • EEPROM is used to store NFC protocol and commands. • FIFO (i.e. buffer) is used to handle transmit and receive	data frames.